A house fire can be one of the most stressful and life-altering experiences you can endure. In just a few minutes, many of your prized possessions can be damaged or destroyed by the flames. However, the damage does not stop after the fire department arrives and extinguishes the fire. 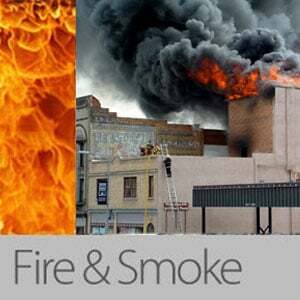 Smoke, soot, and water can all continue to cause damage, which is why it is so critical to hire a company that provides the best fire and smoke damage restoration services. If you do not call in the professionals, it is unlikely that your home will ever be the same again. Smoke, soot, and ashes can all continue to cause damage for days or even weeks after the fire is over. If these are not cleaned up properly within a short period of time, the damage may be irreversible. It is imperative that the cleanup and restoration process starts as soon as possible so that any damage is kept to a minimum. When you are hiring a company to restore your home after a fire, you need to make sure that they are trained and certified to the highest degree. Certification from the Institute of Inspection Cleaning and Restoration Certification, or IICRC, is a sign that a company has surpassed the organization’s rigorous standards. When you are looking for a firm, make sure that they are IICRC certified. Ash and soot need to be cleaned up as soon as possible to avoid permanent discoloration of the items and surfaces in your home. Within minutes, plastic can start to discolor, as will anything that was close to the flames. If ashes and soot are not cleaned off the walls and furniture, these will also start to discolor quickly. Get in touch with a company right away so that you can keep the discoloration to a minimum. You should keep in mind that some objects just will not be salvageable after a fire. While a reputable company will do everything it can to salvage as many of your possessions as possible, some things may have to be disposed of. Having to throw away items that have a lot of meaning to you can be a very trying experience, and a good restoration company will help you get through this difficult time. While the cost of restoring your home to a livable condition may seem high, the longer you put off the process, the more expensive it will become. A delay of even just a few days can add thousands of dollars to the final cost. By acting quickly, you can minimize the damage to your home and reduce the amount that you will have to spend to restore your home to its previous state.